First off, I want it to be known that I'm not much of a liar. 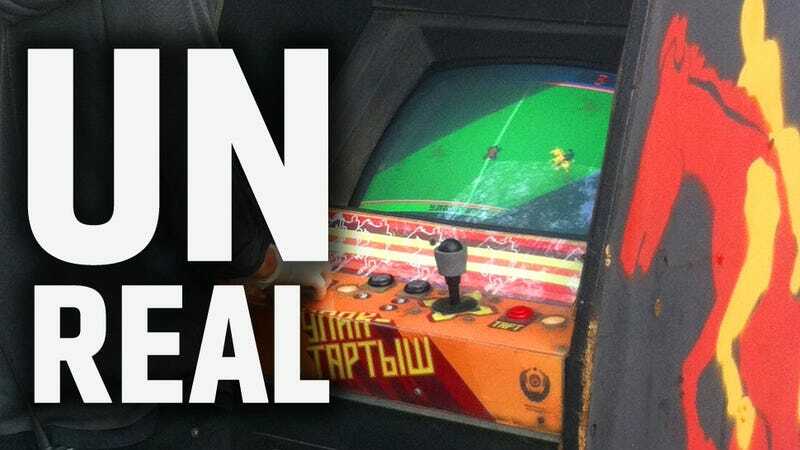 But I do enjoy a good hoax every now and then, but now it's time to come clean: the video game Ulak-Tartysh, based on the Kyrgyzstani sport (sometimes called Buzkashi), that was made behind the Iron Curtain in 1983, is an incredibly detailed fake of my own creation. Let me back up a bit and explain exactly what I'm talking about: Ulak-Tartysh is a video game made in 1983, in the Kyrgyz city of Mailuu-Suu. It represents the sport of Ulak-Tartysh, which is polo played with a headless goat carcass instead of a ball. The game was built in the city's only electronics factory, a military one that was often put into service making civilian products. The Soviet Union at the time wasn't blind to what was happening with videogames in the West, what with our Pac-Man fever epidemics and all, and they decided to make some video games of their own, to, you know, show they could. They had a decent number of these, mostly in and around major cities, but they did make a common hardware platform for smaller provinces to localize for games that would appeal to them. This platform was based on a KR1858VM1 CPU, a Soviet copy of the Z80, which powered Pac-Man and many other Western games. It's pretty crude, with a low-resolution screen, and not much gameplay horsepower, but it works. In the case of Kyrgyzstan, this platform was used to create an arcade game based on the local dead-goat polo sport. Well, that was my story, at least. And I tried to build something that at least felt like it could actually be real. I started with a relatively obscure cabinet from a Data East Super Vollyball game, and removed all the existing art. I removed the old hardware and replaced it with a small ATX motherboard running Linux and an old CRT TV. I took the VGA output of the computer into a converter to make it composite, and then I took that into an RF modulator to make sure the display was sufficiently crappy. I put together fake motherboards with Cyrillic text to hide the actual electronics. The controls were the original arcade controls re-wired through a keyboard encoder and plugged into the usual old PS2 keyboard port. Just like some MAME cabinet folks do. The game itself was programmed in Flash (with coding from my friend Rob Terrell) and was blown up from its 160x116 or so pixel size to fill the screen. For the cabinet itself, I made all the art, with Kyrgyz/Cyrillic text I found from online dictionaries. These dictionaries didn't have many words, but I found the basics I needed: турт (pull/push), Жакшы (good), and so on. I had a new plastic marquee printed, I made a new vinyl sticker for the control panel, made side-art stencils (inspired by old Williams games like Joust), and even changed the coin slots to request a 15 Kopek (Kopeek in Kyrgyzstan) coin. I even added the seal of the military electronics factory that was most likely to have built the game. I also made sure to keep the cabinet nice and beat-up looking, to help sell the idea that this was a genuinely old object. I think the result was reasonably convincing, especially if you wanted to believe it, which most people did. And that sort of brings me to why I did it: I wanted it to exist. I had seen the Soviet Arcade Game museum, and was absolutely taken by the delightful crudeness, the creativity, and the fascinating otherness of the games. It was a mirror-universe version of things well-known from my childhood, and something about them really struck a nerve. So, without any access to anything like them, I thought attempting to remake one, fake backstory and all, would be interesting. I picked Ulak-Tartysh as the game's theme because of how bizzarre and brutally exotic it seemed to American sensibilities, and there's just something funny about a pixellated goat carcass. The hoax spread around quite well. I showed it first at the 2009 i am 8 bit video game/art show in Los Angeles, then used a stint as a BoingBoing guest blogger to push the story more. Soon our Gawker sibling Kotaku picked it up, long before I worked at Jalopnik, then it ended up on a bunch of other blogs and sites. The MAME people wanted a ROM dump of it, and at least one guy who grew up in the Soviet Union said he remembered playing it. It was most recently displayed this week at the UCLA Game Art Festival. I even had a good car-related cover story for how I got it: I was offered a Polski Fiat 126P by a friends family in Poland if I could somehow get it (that part is true). I looked into the process of getting an old crappy Polish car overland to a port and then onto a container bound for the US and found it very expensive and Byzantine (also true). So, after working with a shipping company for a few months, I got to know one of the warehouse guys well, and despite my efforts, the plan eventually fell through. As a way of compensation, the warehouse guy stuck something from a forgotten pile of crap in the back corner of the warehouse into some unused space on an LA-bound container, and emailed me to tell me to show up at the Port of Long Beach on a certain day. In a truck. When I got there, I found the Ulak-Tartysh game waiting for me. That's the not true part. So there's my confession. It's a hoax, a prank. Those of you who could have sworn that cabinet looked familiar or too Western, you were right. Congratulations, fellow nerds! Those of you who believed it, thank you. You were all a key part of what made the project work, and please know it wasn't about fooling anyone or trying to pull a fast one. It was just an attempt to provide a shared illusion of something I really wish existed. And now it does exist. Sort of.